Please note: These fees are subject to change without notification. Most of the appointment is covered by your provincial health insurance (including consultation visit with the Ophthalmologist and certain tests as specified below). Some of the tests that provide more comprehensive information about your eyes, are not covered (see below). If you do not have health coverage, you will be charged a flat fee of $250, which will cover the consultation examination and any additional tests. 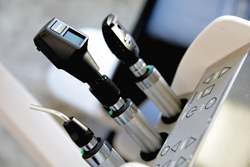 This will include a routine comprehensive examination of your eyes, including testing for glasses. Any extra tests will be charged or covered as indicated below. For patients under the age of 18, all testing is covered by Manitoba Health. For patients between the ages of 18 and 65, the fee is $105; unless you have an insurable medical condition, which decreases the fee to $55 (subsidized by Manitoba Health). For patients over the age of 65, the fee is $55 (subsidized by Manitoba Health). If you have a medical diagnosis such as diabetes or glaucoma, or require examination after laser or cataract surgery, your appointment will be covered by your provincial health care. 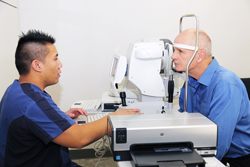 If you are scheduled for a visual field test, you will be called in by one of our technicians at the beginning of your appointment for this test. 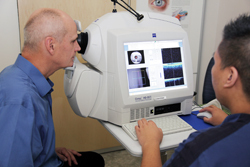 Visual field testing is a way of identifying whether your peripheral or "side" vision and central vision have any blind spots or blank areas. Because your eyes work together and one eye’s visual field overlaps partially with the other, you may not be aware of defects unless each eye is tested separately. Generally, the right eye is tested first, and then the left eye. Your non-tested eye will be patched and you will be seated in front of a dome-shaped machine. Your head will be positioned in a chin rest within the dome. You will be asked to stare at a light straight ahead of you, while other lights are flashed at you from all sides of the dome, one at a time. As you notice these other lights using your side vision, you will need to press a clicking device to tell the machine that you have seen the light. It is important to continue to look straight ahead at the target in front of you and resist the urge to look directly at the other lights. You also need to press the clicking device as soon as you see the other lights. The lights will get dimmer as the test tries to figure out how sensitive your eyes are at picking up light. 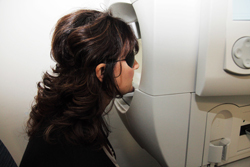 In this way, most of your peripheral or side vision as well as your central vision are tested. Any blank spots in your vision are mapped out. On return and follow-up visits, this test will be repeated to see if there are any changes. This test takes about 6-8 minutes on average for each eye (total test time about 15-20 minutes), and is very useful in understanding if your glaucoma is staying the same or getting worse. Over time, these tests are graphed to show rate of progression or how fast your glaucoma is changing. This gives very helpful information for planning your customized treatment plan. 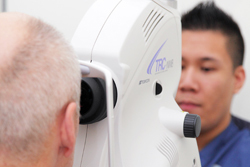 An HRT is a complex picture of your "optic" or eye nerves that can be used to monitor changes over time. One of the technicians will guide you through this process. It requires you to sit in front of a machine attached to a computer. You will be positioned and asked to look at various coloured lights. This test takes about 5 to 10 minutes. At your first visit, a baseline image will be taken, which can be used for future comparison. Every 6 months or yearly (depending on disease status), a repeat HRT will be performed to identify if any subtle degeneration of your optic nerves has occurred. Glaucoma causes optic nerve degeneration over time and this can eventually lead to loss of vision unless it is monitored and treated in a timely manner. 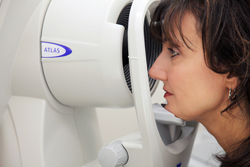 Changes picked up by HRT imaging may not be visible to the naked eye, therefore this testing is extremely useful in picking up early signs of glaucoma or subtle signs of progressive glaucoma. This test does not require any dilating drops and will not alter your vision. You will be able to drive after this test. An OCT machine can produce complex, layered imaging of the front, and back of the eye including imaging of the optic (eye) nerve and macula (central retina). 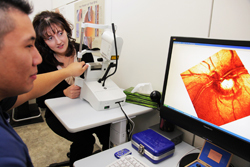 This allows for detailed examination of the various parts of the eye. It can be used to help aid in the early diagnosis and management of glaucoma. It can also be used to assess the retina to help with diagnosis and management of diseases such as diabetic macular edema (swelling), post-cataract cystoid macular edema (swelling), macular degeneration, and macular holes. This test can be an important tool to use for planning cataract surgery (especially if a specialty multifocal intraocular lens is being considered). It is also a powerful teaching tool for patients and their families to be able to actually SHOW you what is going on in your eye (s). OCT imaging takes at least 10 minutes. It will usually be booked as a separate appointment with the technician only. The technician will position you in the OCT machine to take the images, and guide you through the process. 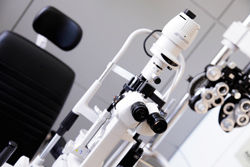 This test usually does not require any dilating drops and will not alter your vision. You will be able to drive after this test (unless there is a rare need to dilate due to poor image quality). This test measures your corneal thickness. Freezing or anaesthetic eye drops (lasting 10 minutes) will be applied to your eyes, therefore you will not feel anything. 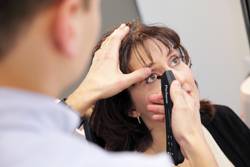 The doctor or technician will use a small hand-held device to gently and briefly press against the cornea making the device beep several times. This records the central corneal thickness (CCT). If your cornea is thicker than the average person, your eye pressure measurements may be artificially high. If your corneal thickness is thinner than average, your eye pressures may be artificially low. Some studies suggest that people with thinner than average corneas may have increased risk of developing glaucoma. Average central corneal thickness is around 545 microns (1000 microns = 1mm). In some patients with glaucoma, eye pressures are never very high. In these patients, it is important to consider possible spikes of pressure that we are not able to catch since the pressure changes throughout the day. If spiking pressure is suspected, a DTC may be ordered. 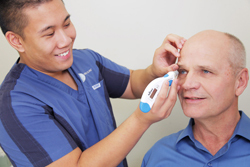 These are usually performed by the technicians or Dr. Buffie, and require a quick eye pressure check every hour throughout the day or half-day (mini-DTC). This will give more insight into a patient’s risk for developing glaucoma, or progression of existing glaucoma, and will help your doctor decide the proper treatment for you. This is a long day or half day, however, we encourage patients who have this test to take the day off and enjoy the amenities of the mall in between pressure checks. The pressure checks will require freezing drops each time (since freezing only lasts for about 10-15 mins) and should not take longer than a few minutes on each hour. A DTC is usually scheduled throughout the day (or half-day) from 8:30 to 4:30. Your approximate prescription for glasses is measured with this test, which is performed by the technician. The technician will guide you through it, placing your chin in the chin rest of the auto-refractor machine, and taking measurements while you are staring at the targets in front of you. It is a very simple and fast test, taking about 5 minutes in total. This measurement may be used as a baseline for testing you for glasses, or as pre-operative information for cataract surgery. You do not need any freezing drops for this test and it will not distort your vision. Disc is another word for the front end or "head" of the optic (or "eye") nerve. Since glaucoma causes changes in the optic nerve, taking a photo or picture of it will provide something for comparison in the future. The photographer will position your head in the camera (called a "fundus camera"), and take some pictures with flashes. You do not need any dilating or freezing drops for this test (however, if your pupils are too small for the test, you may have to be dilated with drops - "Dilation of Pupils"). By dilating or widening your pupils, your doctor will be able to see the whole of the inside of your eye. Looking through an undilated pupil is like peeking into a keyhole and trying to see the room inside. Looking through a dilated or widened pupil is like opening the door to the room and looking inside. It is much easier to see the whole of the room by opening the door. 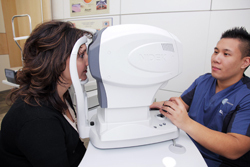 This allows a better view of the whole retina, optic nerve and macula (the central retina). This is done routinely, usually on an annual basis, and sometimes if a patient is experiencing symptoms such as decreased vision, flashing lights or floaters. 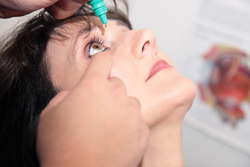 In order to dilate your pupils, special eye drops are given - usually 2 drops per eye. These take about 20-30 minutes to cause dilation. Either the technician or the doctor applies these drops. After your pupils are dilated, your doctor will use some lights and lenses to examine your eyes. We always try to confirm whether you are prepared for this test since the dilation effect causes blurry vision especially for near vision, and glare with bright lights. The dilation effect typically lasts up to 4-6 hours and can last even longer in some people. It is not advisable to drive after being dilated. You should also bring your sunglasses to wear afterwards. This test is used to measure the surface of your corneas to see if you have any unusual corneal thinning and whether you might be eligible for special implantable lenses for cataract surgery. It is advisable to use lubricating eye drops (artificial tears) 3-4 times per day to each eye for one week prior to this test. If you wear contact lenses, you should not wear them for 2 weeks prior to having this test, otherwise the results may not be accurate. The technician will take these measurements by seating you in front of the machine and positioning your head on the chin rest. The measurements do not take long and there are no anaesthetic drops required. Missed appointments: If you fail to give 2 business days notice that you are unable to attend your appointment (barring emergencies), or if you simply do not show up for a scheduled appointment, you may be billed. Forms: Forms are filled out within 1-2 weeks (barring exceptional circumstances) and are charged at a rate of $50 per form. If a form is required earlier that this, an extra $25 will be charged. In cataract surgery, the cataract is removed. A cataract is our natural lens inside the eye that has become clouded over and foggy to look through over time. This happens most commonly with age, and also with certain diseases and medications. When the cataract or "cloudy lens" is removed, it must be exchanged with an artificial lens that is placed inside the eye ("intraocular"). These lenses stay in the eye forever and usually do not require any changes or alterations. Without an artificial lens, we would need very thick "coke bottle" glasses to see clearly. There are different types of artificial lenses available. Soft, foldable, single distance lenses that make vision clear for the distance, but not for up close and intermediate distances, are now covered by Manitoba Health. With these single distance lenses, you will still need reading glasses. Premium lenses are also available, that can correct for astigmatism, and for near, intermediate and far distances. These specialty lenses can provide excellent vision at all distances, therefore the majority of time, you should be independent of using glasses. However, for longer periods of reading or in low lighting conditions, you may need to use glasses. The cost of various premium lenses is listed below. Toric Intraocular lenses - Fee $1,018.00 per eye: Some people have oval shaped eyes that causes "astigmatism". This can be corrected with a pair of glasses after surgery, or can be corrected inside the eye with a Toric intraocular lens. These lenses are $1,018.00 per eye, which includes cost of lens, extra testing, determination of appropriate lens power, marking and proper positioning of lens during cataract surgery. These lenses do not provide near or intermediate distance correction, therefore you will have to use reading glasses to see up close after surgery. However, your distance vision should be very clear without glasses. Multifocal lenses - Fee $1,877.00 per eye: These are a special type of lens that corrects your vision for near, intermediate and far distances. These lenses are excellent in good lighting conditions, however you may still need reading glasses for low lighting conditions. They are not generally recommended for patients with pre-existing vision problems from conditions such as macular degeneration and glaucoma. Please consult your doctor if you are interested in these types of lenses and to see if you are a candidate for them. The fee of $1,877.00 includes the cost of the lens, extra testing, determination of appropriate lens power and proper positioning of the lens during cataract surgery. Multifocal toric lenses - Fee $2,200.00 per eye: These lenses correct for astigmatism and also offer correction for near, intermediate and far distances. These lenses are excellent in good lighting conditions, however you may still need reading glasses for low lighting conditions. They are not generally recommended for patients with pre-existing vision problems from conditions such as macular degeneration and glaucoma. Please consult your doctor if you are interested in these types of lenses and to see if you are a candidate for them. The fee of $2,200.00 includes the cost of the lens, extra testing, determination of appropriate lens power, marking and proper positioning of the lens during cataract surgery.